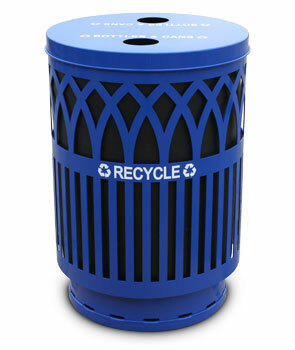 Encourage green initiatives with the Covington Collection Recycling Receptacle. Perfect for busy downtown areas, sidewalks, and shopping centers, this receptacle allows for proper recycling management while adding to the overall aesthetic. The flat top lid features two 4" openings specially designed for bottles and cans. Two "Bottles & Cans" decals are included. Constructed with durable, long lasting steel, the intricate design is laser cut to perfection and deters graffiti. Each trash receptacle comes standard with a black high density rigid plastic liner, encapsulated lid security cable, ground anchor kit, 3 stainless steel leveling feet and 3 anchoring feet. The bottom ring is dipped in corrosion resistant plastisol for added durability and will match your receptacle color.